Three months ago I decided I wanted to start running, but like many people I did not really like running. I figured the best approach was to just jump “feet” first into the idea of becoming a runner. After a few weeks I was making physical progress but, I was still not mentally into the run. I was doing the run, but not being in the run. 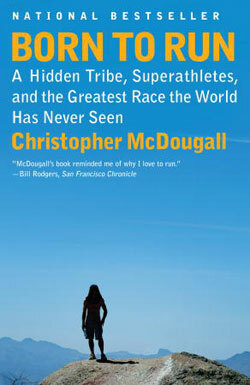 Then in my quest for inspiration I happened to be reading a Runner’s World article about how Flea from the Red Hot Chili Peppers was inspired by the book Born to Run by Christopher McDougall. So I picked up a copy of the book and started reading. I was amazed how it quickly transformed by view point on running. My next run I decided to ditch the iPod and focus on being mindful during my run. I focused on my breathing, how my legs felt, the temperature outside, how it made me feel, the trees, the wind, essentially the pure feeling of the run. @bearrunner, yeah I have noticed that a lot of musicians are serious runners. Wow Jim, that is an amazing and inspiring story. Congrats on the Tucson full marathon. I am going to have to checkout “The Big Book of Endurance and Training”, sounds like a great book. I just turned 41 this year and what is astonishing to me how running, especially trail running seems to make me feel strong with greater endurance than when I was 21. Another great book is Running with the Mind of Meditation: Lessons for Training Body and Mind (http://www.amazon.com/gp/product/0307888169/) – really helps you find ways to create your own motivation and focus on the pure joy of the run. Yes, we need to run together very soon. I work from home (software engineer) and I do most of my runs in the afternoons or weekend mid mornings. Let’s figure out when we can sync up our schedules and go do a trail run.